June 6-7, 2018 | Washington, D.C. The 2018 International Grantmaking Symposium is presented by CAF America in partnership with The George Washington University, Center for International Business Education and Research (CIBER). The IGS is a two-day executive training on the ins and outs of international grantmaking, bringing together leaders in international philanthropy to discuss the vision, the implementation, and the impact of your philanthropic initiatives. The Symposium will take place at The George Washington University, Elliott School of International Affairs on the 7th floor in the City View Room. The address is 1957 E St. N.W., Washington, D.C., 20052. 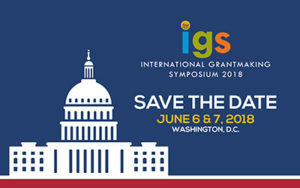 Click here to take a look at the Schedule at a Glance for IGS 2018! The Symposium is recommended to nonprofit organizations, corporate foundations and corporations interested in international grantmaking and/or international giving. The Symposium provides a forum for grantmaking professionals, CSR managers, foundation leaders, and corporate executives to gain an in-depth understanding of the international grantmaking ecosystem within the context of increasingly complex regulatory frameworks. The Symposium conveys the most up-to-date information about international grantmaking, while creating a space for debate and discussion about how legal, political, social, and economic developments across the world impact philanthropic giving. With each session led by experts in their respective fields, participants will be able to connect with thought leaders and practitioners from top organizations in philanthropy. The 2017 IGS explored the ecosystem of international grantmaking within the context of increasingly complex regulatory frameworks. The State of International Philanthropy | The session discussed maximizing philanthropic strategies abroad and identifying opportunities within an increasingly complex climate as shaped by the various regulatory frameworks and the overarching Sustainable Development Goals. Country Spotlights | These sessions took an in depth look at given countries, their current regulatory environment, and explore the practical realities of working in and granting to these countries. The countries that will were covered included: China, India, and Mexico. Mechanisms for International Grantmaking | We discussed the various available options covering U.S. 501(c)(3) Organizations, “Friends of” Organizations, Intermediary Grantmakers, and Direct Cross-Border Grants. ER & ED | A very detailed session focused on the key attributes of both ER & ED discussing the relevant IRS Rules and Regulations; defining the “charitable purpose”, grant agreements, grantee and grantor reports, and much more. Giving responsibly. Anti-Money Laundering (AML) constraints on International Grantmaking | The session discussed compliance with AML and other U.S. Financial Transaction laws within the context of international grantmaking, and elaborate on how to develop sound compliance protocols. Want to know more? Check out our past symposiums! IGS 2017 | In Partnership with Tufts University, Tisch College of Civic Life, Boston, MA. Our host hotel for the 2018 IGS is the Foggy Bottom Courtyard Marriott, located at 515 20th Street NW, Washington, DC 20006 USA, just around the corner from the conference venue. To reserve a room during the Symposium, please visit the Registration Page. Rooms within the IGS block are first come first served. For additional information contact Brian Kastner at brian@cafamerica.org.